At Marine Results our dedicated 60 tonne test machine puts superyacht rig products to the ultimate test. The horizontal tensile testing machine enables rigging, spar and lifting equipment to be ultimately and accurately tested to ensure that the design and manufacturing specifications of equipment meet safe working loads. The machine tests loads which include splices for halyards on the world’s largest superyachts, hydraulic cylinders such as vang and backstay, jammer loads and tender lifting equipment. The machine, which is externally calibrated in accordance with ISO 7500-1:2004, works using destructive testing to bring the individual products under load and was custom designed for use in the marine sector. 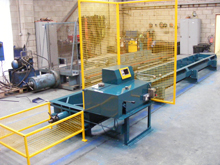 The machine is 11 metres long and operates using a hydraulic cylinder. It is vitally important that we have an accurately calibrated testing machine. We are splicing halyards for yachts of up to 88 metres so the loads are extreme, and there is no room for error. Having the facility with a machine of this size means we can provide a highly accurate testing service to our clients. In spring 2013 we extensively tested the running rigging of Aglaia to collect valuable data for supplying new rope work. The power pack from the load testing machine is also utilised for testing hydraulic systems and cylinders after servicing in the workshop. The machine is also customised to carry out cycle testing ie. repeated application and releasing to replicate the forces experienced by a yacht at sea.